Leucospermum tottum (L.) R. Br. Common names: for genus: Speldekussing, Vuurhoutjies, Matches, Pincushion. Leucospermum tottum is a handsome, much branched shrub whose flowers are excellent for flower arranging. The plant produces an abundance of pale pink to salmon orange flowers, which give the impression of growing more or less horizontally at the end of the branches. It grows to a height of about 1.5 m and, when provided with enough space, will grow to a diameter of 2 m.
The flowers are excellent for flower arranging, but do not stand up well to being packed in boxes. For the private home gardener and flower arranger, this is a very attractive shrub. The plants are suitable for planting in the foreground of a large border. A good plant combination that will provide a long period of colourful flowers, is L. tottum with L. cordifolium and Phylica plumosa. The flowering season is slightly later than that of Leucospermum cordifolium. It starts in mid October and lasts until the end of December. 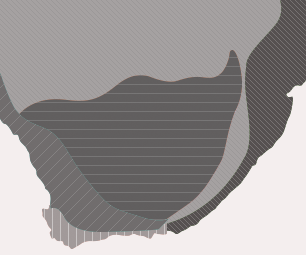 It grows in acid, nutrient poor soils on sandstone slopes at altitudes between 300 and 2000 m, particularly in the mountains of the south western Cape, from the Cederberg to above Villiersdorp. It is part of the Cape Floral Kingdom and occurs only in the winter rainfall area, with wet winters from May to September and hot, dry summers from December to the end of February. Leucospermum tottum belongs to the protea family and is indigenous to South Africa. Other genera of the protea family that produce striking and ornamental flowers are Leucadendron and Protea. The inflorescences consist of a large number of small flowers and it is the stiff protruding styles that are the source of the common name, "pincushion", for this genus. Only a few large hard nut-like seeds are produced by each inflorescence. In their natural environment, the seeds are collected by ants and stored in the soil. They germinate only after a fire has killed the mature plants, thereby returning nutrients to the soil. During flowering time, the numerous birds that arrive to pollinate the flowers are an added attraction. In the early hours of the morning the abundant nectar flow attracts a variety of small insects, which in their turn attract the Cape Sugar bird and three species of sunbird. These insectivorous birds make use of the small insects, as well as the nectar, and in the process transfer pollen from one flower to the other. The flowers are not self-pollinating and depend on small Scarab beetles and birds for pollination. 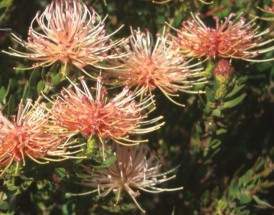 Leucospermum tottum can be propagated by seed or from cuttings. Seed should be sown at the end of February when the nights start to cool off. For best results, always use fresh seed. Soak Leucospermum seed in water to which hydrogen peroxide has been added, at the ratio of 1% of the total volume. This loosens the outer seedcoat and oxygenates the seed. Rub off the softened seedcoat and dust the seed with a systemic fungicide. 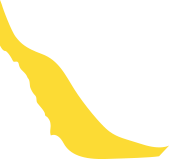 Sow on a well-drained medium, firm down and cover with a layer of sand in an open seedbed in full sun, or in a seed-tray placed in a sunny position. Germination starts after three to four weeks. The seedlings will have to be pricked out in batches, as the seed germinates at different times. If the root is very long and has been removed without damaging the root-tip, the root-tip should be pinched off to promote root growth. 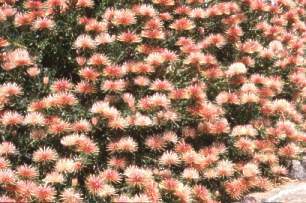 Leucospermum tottum can be propagated by cuttings from January to March-April. The cuttings are semi-hardwood, 6-10 cm long and of the current season's growth. The cuttings should be dipped for about four seconds in a rooting hormone solution and placed in a growing house with bottom heat (25ºC) and intermittent mist. The young seedlings or cuttings grow fast and are ready to be planted out after a year. Three years after sowing, the plants will produce their first flowers. When Leucospermum tottum is planted in the garden, the natural habitat should be kept in mind and the following points are very important for choosing a site: good drainage, a sunny aspect, good air circulation and adequate water. The plants do not like to have their roots disturbed and it is a good idea to put a thick layer of mulch (milled bark, rough compost, leaf litter) around the plant. This will suppress weed growth and keep the soil moist and the roots cool. No manure should be used, although well-matured compost mixed into the soil before planting can be beneficial. The recommended planting distance is 0.65 m and the planting hole should be just slightly larger than the root ball. During the first two years the young plants must be watered regularly. The plants are fairly long lived when planted in a suitable position. They are very sensitive to the fungal disease Phytophthora cinnamomeum. By the time the disease is noted it is too late to try and save the plant, but otherwise the plants are quite problem free.